Districts: Van Ninh, Ninh Hoa, Dien Khanh, Khanh Vinh, Khanh Son, Truong Sa. Geography: Khanh Hoa Province is a coastal province of South Central Vietnam. To the north, it borders on Phu Yen Province, to the west, on Dak Lak and Lam Dong provinces, and to the south, on Ninh Thuan Province. The Khanh Hoa coast is 200km long, with more than 200 islands offshore, of which Truong Sa District gathers over one hundred islands around. The two largest rivers flowing through the province are the Cai and Danh rivers. Transportation: Various forms of convenient transports are available. Road:The National Highway 1A and the railway from north to south run through Khanh Hoa Province, linking it with the other provinces in the North and South. The National Highway 26 links Khanh Hoa to some provinces in the Central Highland. Nha Trang is 105km from Phan Rang, 190km from Buon Ma Thuot, 205km from Dalat, 238km from Quy Nhon, 441km from Ho Chi Minh City, and 1,278km from Hanoi. 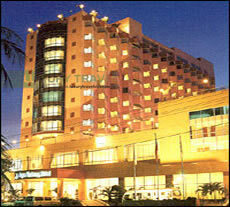 Airlines:Nha Trang Airport is 5km from the center of the city. Vietnam Airlines offers daily connections with Ho Chi Minh City and Hanoi, and four connections a week with Danang.Cam Ranh Airport is 35km south of Nha Trang has flights from Hanoi, Ho Chi Minh City and Da Nang to there. Train:Regular connections between Hanoi and Ho Chi Minh City all stop in Nha Trang, daily train between Ho Chi Minh City and Nha Trang. Water:Cam Ranh and Nha Trang ports connect Khanh Hoa with many regions in Vietnam as well as with abroad. VinPearl Resort and Spa Hotel Nha Trang, the newest offshore island resort in Vietnam is located on the Hon-Tre island. The VinPearl Resort and Spa Hotel Nha Trang is set on 5,700 sq.m of a private tropical island, the largest tourism resort in Vietnam. The VinPearl Resort and Spa Hotel Nha Trang commands a prime beachfront located on the lagoon facing the open sea. The area?s white sands and crystal clear water provide an excellent sanctuary for the abundant marine wildlife. - Two hours North of Nha Trang, the Whale Island. Transparent water, coral and coconut trees underline the tropical exoticism. We discovered the place by cruising in the area. To get settled was not s easy, but the paradise deserves itself and it's now our home. A few steps away from a white sandy beach. Within walking distant of beaches, bar and favorite hang -out places. - In the heart of this vibrant, beautiful and charming city is the NhaTrang Lodge Hotel, the ideal home away from home for leisure or business travellers. 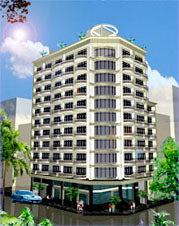 The hotel offers the perfect combination of up to the minute service and quiet Vietnamese politeness. Whether your stay is for business or pleasure, you can be assured of the ultimate in both comfort and service. Whether you are traveling to Nha Trang for business or pleasure, let Asia Paradise Hotel - a brand new modern 3 star deluxe hotel ensure your visit as memorable as it is comfortable. Guests staying in Asia Paradise will experience the best in personalized service and first class facilities mixed with the warmth of Vietnamese hospitality. Que Huong Hotel is an international three star hotel, situated on the picturesque and romantic Tran Phu Boulevard of the municipal beach. Bao Dai's Villas is one of the few remaining examples of French colonial architecture in Vietnam. - Built in 1923 as a holiday resort for the last Vietnamese King Bao Dai and Queen Nam Phuong, the Villas sit on a promontory of 120,000m2 of lush vegetation. The Villas overlook the South China Sea, its coastal islands and enjoy sea breeze all year round..
- There are 48 rooms in 5 original Villas and 2 newly-built blocks with modern facilities, 2 sea-view restaurants and 1 conference room. - On romantic Tran Phu Boulevard, adjacent to the beach in the heart of Nha Trang City. - Our hotels locate along Nha Trang beach with comfortable and spacious rooms, parking lots, European - Asian cuisines, seafood and Vietnamese cuisine. Sunny Beach Hotel a brand new modern 2 star deluxe hotel ensure that your visit will be as memorable as it is your visit will be as memorable as it is confortable. Guest staying at the Sunny Beach Hotel experience the best personalized service and first class facilities together with the warmth of Vietnamese hospitality. Only very short walk to the Center of Nha Trang city, near entertainment, shopping area, and 30m from the Beach. At Sunny Beach Hotel, enter a world of hospitality where Smile abounds, where the service is gracious and your every need is anticipated.